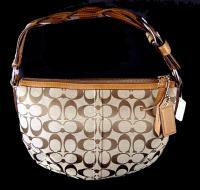 For example, my wife said that she wanted a Coach purse for her birthday last January. She even e-mailed me a wonderful “reminder” that Coach’s website will send to unsuspecting husbands. I ended up getting my wife something else that she wanted for her birthday, but I kept a printout of the purse to make sure that I eventually bought the correct make and model. Heaven forbid I get that wrong. These purse designers have more models than Ford and GM combined! By the time I got around to deciding on buying the one my wife wanted last month, of course, it was discontinued by the fantastic people at Coach. So I had to stalk the purse on eBay. The best part of the deal was that I got it at a $50 discount by waiting and buying it on eBay even though it was next to impossible to find.